I’ve always heard good reviews of the restaurant inside the Tate Britain but it’s not somewhere I’d ever actually gotten around to going to. It’s always somewhere that has appealed to me as well as i absolutely love the Tate Britain, for me it’s one of the most relaxing places in London and somewhere where, unusually for me, I don’t mind being alone. Unlike the restaurant at the Tate Modern which is casual and usually packed full of tourists, the restaurant at the Britain is fine dining and tends to attract a predominantly british crowd. I probably still wouldn’t have made it had it not been for my mum wanting an amble around the gallery itself in the morning. I was supposed to be meeting her at 10 for a relaxed morning, strolling around the current exhibitions but the last nights festivities may have gotten in the way slightly (Brekke was headed back to Norway and i think we finally crawled exhausted into bed at about 7am). As a result, i didn’t make my morning of culture but did manage to arrive just in time for lunch (surprise surprise) and boy am I glad i did. Nestled away in the basement, it’s a beautiful room, the walls covered in murals by Rex Whistler make a gorgeous backdrop and a nice change from the usual stark walls you find in a lot of restaurants. The light boxes on top of the pillars that run the length of the room add to the atmosphere as it gives the impression that the ceiling is floating, unsupported over the dining room. The menu is the brainchild of Paul Newbury and is aimed at being seasonal and british, focusing on local ingredients. We ordered from the A la Carte menu but it did take some deliberation as the set lunch menu also looked pretty tempting. It’s really reasonably priced as well, 2 courses from just £16.50 and for a mere £31 you can have 3 courses as well as matched wine for each course. That sounds pretty bargainous to me. 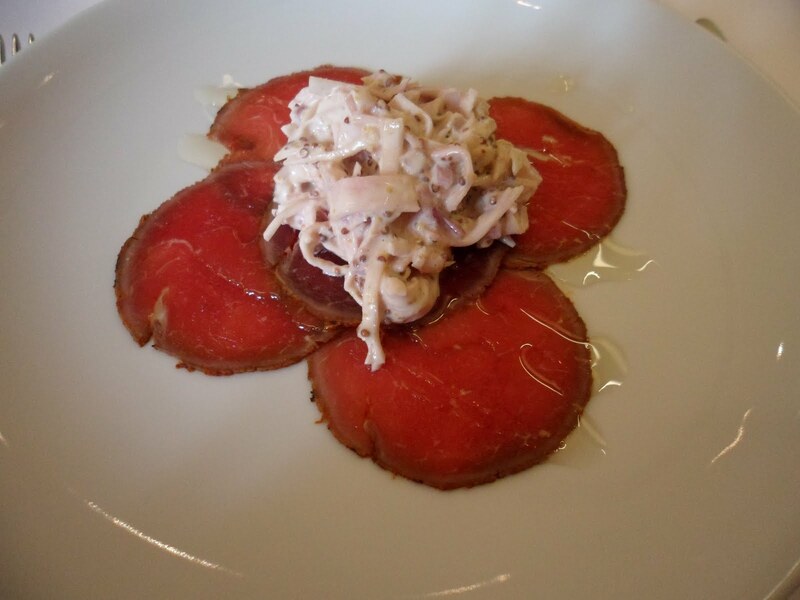 I just couldn’t resist the siren song of Beef Carpaccio though, hence the A la Carte option and i’m glad i succumbed, i was just what i needed to kick start my tastebuds. The most melt-in-the-mouth tender fillet of black label Devonshire beef rested under a perfectly punchy mound of celeriac remoulade and the truffle oil was just the earthy note it needed to really pull everything together. i wish there had been more, it was divine, although i will admit that the beef was lost a little compared to the remoulade. But, oh, the remoulade. I could have just eaten a bowl of that and been happy. 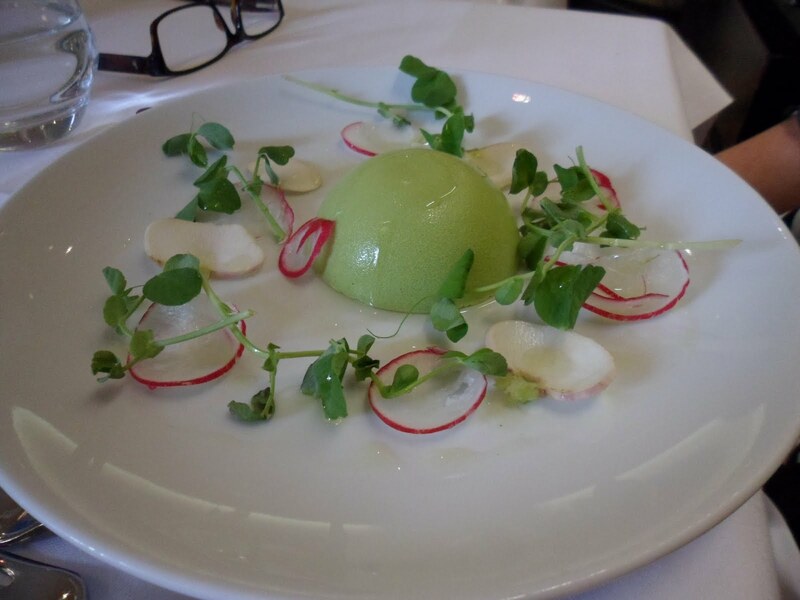 Mum went for the Pea Panna Cotta with shaved turnip, pea shoots and mint oil. I was glad she opted for this as i was tempted by it aswell so i was pleased i had the chance to try it. This was yummy but remarkably strong in flavour for something as delicate as a pea and i’m not sure i could have eaten a whole one. Indeed, mum didn’t manage to finish all of hers. I love the idea of it as a dish though, so with a few tweaks, it’s something i think i might be trying before too long. Also, it’s just so darn pretty, like summer on a plate. After that, we both went down the fish path, for me this was mainly because i saw samphire in the dish, something i struggle to resist when it’s in season. As anyone who knows me will tell you, i’ll normally go for the meat option but i was feeling the need for something altogether lighter and fresher that day. 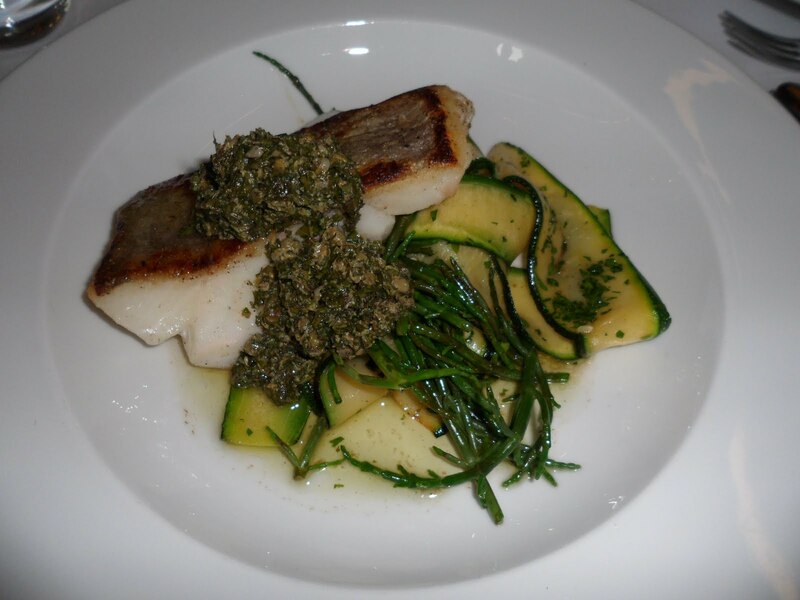 After what felt like an hour, i finally settled on the pan fried cod with samphire, courgette and caper/herb sauce. It was perfect for the mood i was in. Bursting with flavour from the capery sauce, the cod was cooked to perfection although the fillet was definitely rather large, i didn’t quite manage it all. The samphire was just what i wanted, salty, just a little crunchy and tasting of the sea. Something worth returning for. 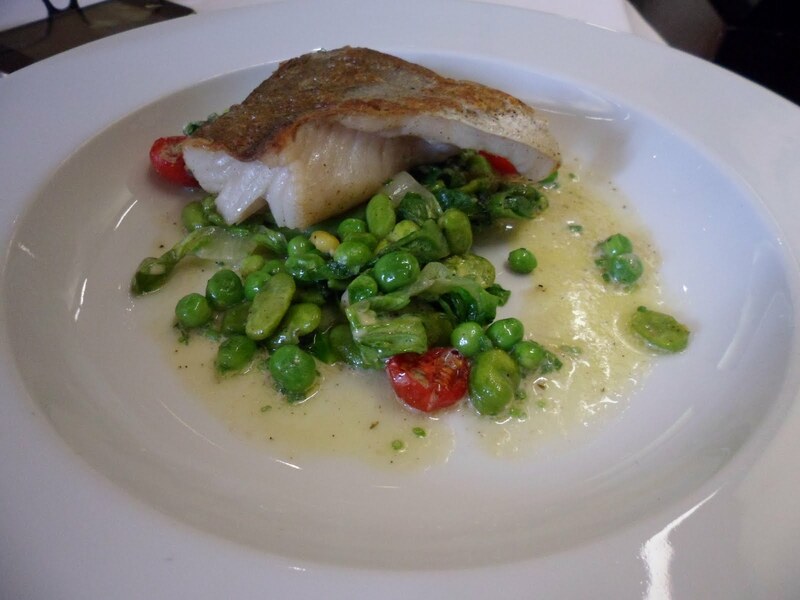 Mum went for the catch of the day, fillet of pollock with a salad of broad beans and baby leeks with semi dried tomatoes in a butter sauce. I didn’t actually try this but she was very impressed, pretty much wiping the bowl clean which is always a good sign. She went for the wine match on this one, a crisp reisling which, although isn’t a usual choice for her, complemented the fish nicely.